The University of Illinois at Chicago women’s tennis team lost to 2018 Big Ten regular season Champion, No. 19 Northwestern, by 0-7 in a one-sided, two-hour matchup to start the dual season on Friday afternoon. The UIC Flames kicked off their new dual season in Evanston with the absence of four seniors who had graduated. Still, the Flames were led by three elite transfer student-athletes, Lejla Colic, Karyna Bihel and Lucie Prochazkova, as their top three singles players. “I think our team is better this year. We are deeper. We have more players who have been inserted in the lineup,” said head coach Shannon Tully after the match. The match started with three doubles matches playing simultaneously. As expected, Northwestern cruised in all doubles events. 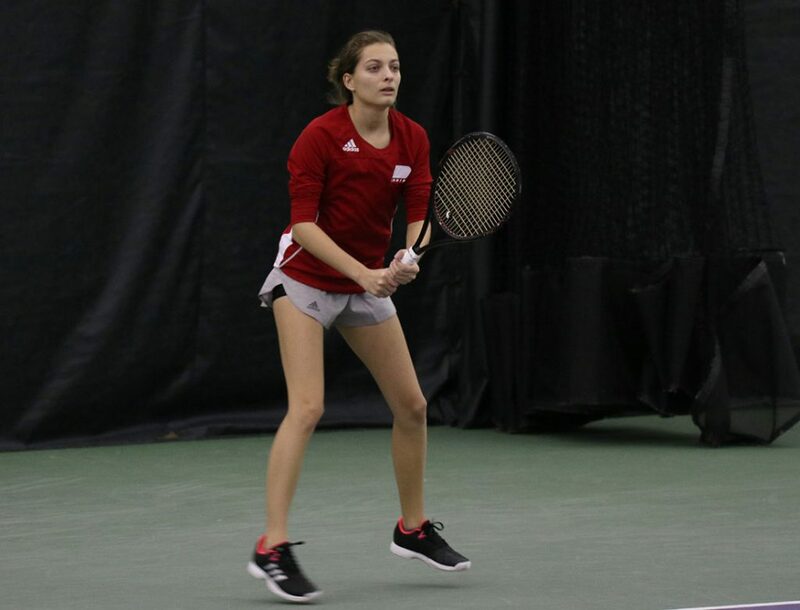 UIC players took away some positives from their doubles matches, particularly in preparing for their singles matches afterwards. Based on the strength of the players, UIC experimented with a new lineup. Colic, from Bosnia, earned designation as the No.1 singles player for the Flames in the match. The junior transfer made her first appearance since last April. Due to an injury, Colic had been sidelined for rest of the year. The Flames resumed training last week after a month-long winter break. Players are trying to improve their game physically and mentally, according to Tully. The Flames made some unforced errors in some big point plays, costing them opportunities. Colic missed several overhead shots in the tight second set of her singles match. Learning is more important than the result for the Flames after facing the strong Wildcats. As the chosen No.1 team in Horizon League, the Flames accumulated some valuable experience from the loss. “We need to turn up the intensity a little bit. We (should) work more on footwork and bring in more offense that would be key to get better results in the future,” Tully said. Players benefited from Tully’s coaching suggestions after executing them on the court. After competing with the best team on their schedule, the Flames face another Big Ten team, the Wisconsin Badgers, next Friday on the road.